Good Cocktails - What Are Well Drinks? What is a well drink? A well drink is a mixed drink made with the cheapest liquor available at the bar. For the most part, it consists of one house liquor and mixers. Note: The cheapest liquor is also called the well liquor. What kind of liquor is used in well drinks? The liquors used in well drinks are vodka, gin, rum, tequila, bourbon, scotch, brandy and whiskey. Some bars will include some liqueurs like tripe sec, melon liqueur, peach schnapps, raspberry liqueur, amaretto, etc. Note: Keep in mind that the liquors and liqueurs used in well drinks are not brand names, for most bars. What brand of liquor is used for well drinks? It varies from bar to bar. It's usually a generic liquor. In other words, it's a brand that you have never heard of. It's usually the cheapest liquor that bars get from their distributors. Note: Many upscale places don't use generic liquors, so their well drinks are made with brand name liquors. Of course, the brand names used for well drinks are the cheapest of their liquors. Why do they call them well drinks? The term comes from the "well" which is the place where the bartender has the ice, juices and the most used liquors and liqueurs. 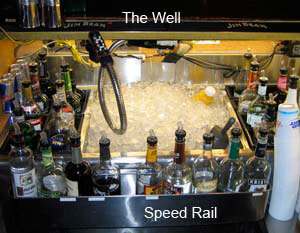 The well liquors are kept in the speed rail right in front of the bartender for an easy access. Are there any other types of drinks besides well drinks? Yes. There are call drinks, premium drinks (also called top shelf drinks) and super premium drinks. Could you explain the differences of all the types of drinks? Sure! I'll try to put it in simple terms. Premium Drink - A drink made with an expensive liquor. Also called a top shelf drink. If you order the cheapest vodka (a generic brand) and cranberry, you get a well drink. If you order an Absolut vodka and cranberry, you get a call drink. If you order a Grey Goose vodka and cranberry, you get a premium drink or top shelf drink. Note: A premium drink is also a mixed drink made with several liquors like a Long Island Iced Tea and a super premium drink will be like a Top Shelf Long Island Iced Tea. So, if I just order a Cape Cod, do I get a well drink, call drink or premium drink? If you don't specify what kind of liquor you want, many bartenders will pour the well liquor, so you get a well drink. Note: Not all bartenders will pour the well liquor. Some bartenders will pour a premium liquor when you don't specify. I always suggest that you specify what kind of liquor you want in your drink. That way, you know exactly what liquor you are getting. At many bars, the bartenders will ask you what kind of liquor you would like. Note: If you want the cheapest liquor, you don't have to say, "Give me the cheapest liquor," you could say, "I want my drink with the well liquor." It sounds better and it doesn't make you sound like you are cheap. Since well drinks are made with the cheapest liquor, they have to be the cheapest mixed drinks. That is why many places have well drink specials. Haven't you noticed that when you go to Happy Hour there are well drink specials? Note: A well Vodka and Red Bull is not the same price as other well drinks. The reason is because energy drinks are more expensive. There is an additional charge for energy drinks. Could you give some examples of well drinks? Sure! Instead of writing a list of well drinks here, I created a new page that contains a list of well drinks.